Smith was far from the only reason Washington beat Arizona 24-6 on Sunday. 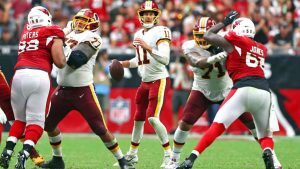 But he orchestrated the offense in a performance the Redskins would like to see duplicated. Of course, it helps when a team can run the ball the way Washington did Sunday, finishing with 182 yards. Then again, part of the reason Washington ran well was because of Smith’s ability to handle a heavy dose of run-pass option plays. It’s what they hoped for when making the trade for him, moving on from Kirk Cousins. Smith made strong decisions, which is one reason why they turned the ball over only one time — on a late fumble by Adrian Peterson. In Gruden’s first four openers, the Redskins had lost the turnover battle each time, thanks to 10 combined giveaways. Gruden mentioned the turnover stat leading into the game whenever he was asked about being 0-4 in openers.